Meet our Executive Officers, keep up to date with our Annual Meeting Programs & view Our History. There is a remarkable link between the origins of modern orthopaedics in the UK (and subsequently in North America) and what happened in Anglesey in the 18th century. The north Anglesey coastline is treacherous. A shipwreck occurred one stormy night between 1730 and 1745. There were only 2 survivors – 2 young boys. They were swarthy and spoke a foreign language. Their origin is uncertain. Possibly they were Spanish because of Catholic links with Scotland or possibly Scots speaking Gallic escaping to France following the Jacobite rebellion of 1745. One of the boys was brought up by a local doctor and he was given the name of Evan Thomas. It soon became clear that he had special skills in healing injured birds and animals. He was so successful that the locals went to him for treatment. Indeed, the gentry also went to him. He treated Lady Bulkley after local doctors had tried and failed. Lord Bulkley was so impressed he commissioned a marble plaque to commemorate his achievements which is still to be seen inside the parish church of Llanfairynghornw. Evan Thomas had 4 sons, the most famous of which was Richard Evans (1772-1851). Note the tradition of naming sons after their father Richard ap (son of) Evan. He earned his living as a farmer. He was a very religious and pious man and woe anyone who mocked him. There is a story about him in a local fair where some young lads started to mock him and one pretended that his shoulder was dislocated. Richard Evans apparently grabbed him and really dislocated the shoulder. The lad had to beg him to reduce the dislocation. Richard Evans was the father of 3 sons and 4 daughters and they all practised as bonesetters to some extent. Two of the daughters emigrated to America and practised their skills in Wisconsin. Evan Thomas was the most famous. He too decided to emigrate and join his sisters in America in 1831. However, on reaching Liverpool he did not have enough money for the passage. To earn money, he worked in a foundry where he encountered an alarming number of industrial injuries which he naturally treated. Soon word got around about his bone setting skills and Evan Thomas realised he did not have to go to the America to earn a living. He set up his home and surgery in Crosshall Street, Liverpool. Eventually, the Duke of Westminster was one of his patients. Initially, his relationship with the medical profession was cordial. Many doctors were happy to send him trauma cases. At one time there was talk of appointing him to the staff of the David Lewis (the Northern) hospital but this did not materialise. Gradually, the relationship soured as the medical profession became jealous of his significant earnings from his work. The Medical register came into existence in 1858 and Evan Thomas tried to get his name on it but failed because of opposition by the Liverpool medical world which was, by now, openly hostile towards him. Disgruntled patients were urged to litigate. Nine attempts were made to sue him including a manslaughter charge but he was never found guilty. Tynllan in Bodedern, Anglesey, the home of Evan Thomas’s wife. They had 5 sons and 2 daughter. Interestingly, all 5 sons became doctors. Obviously Evan Thomas realised the days of the unqualified bonesetters were coming to an end. In August 1834 Evan Thomas and his pregnant wife visited the old home. A son was born in Tynllan on the 23rd of August 1834. The house is now a farm outbuilding and has a plaque commemorating the birth of Hugh Owen Thomas, probably the father of modern orthopaedics. Although referred to as meddyg esgyrn (bonesetter), he was medically qualified with LRCP MRCS, which he rarely used. Hugh Owen Thomas was a frail, sickly child. His parents were worried about his health. The Anglesey air was considered to be better for him than Liverpool air so he was sent him to live with his grandparents in Rhoscolyn, Anglesey until he was 13. An eye injury at school caused an ectropion which he protected by wearing a peaked cap pulled low over the eye, one of his trade marks. The others were his frock coat and cigarette. After leaving school, he was apprenticed to his uncle, Dr Owen Roberts of St. Asaph and went to Edinburgh University when he was 21. 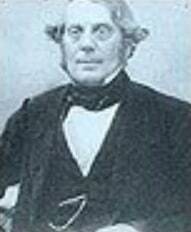 At this time, Lister was Syme’s houseman and starting his work on antisepsis. However, Hugh was horrified at the number of amputations being performed for tuberculosis as he had seen his father treat such patients conservatively with good results. After 3 years he left Edinburgh to went to University College Hospital in London. All 5 brothers were in London together now. In 1857 he was just about to take his finals when his father became ill so he had to return to Liverpool to look after his father’s practice while he recovered. As he missed his exams he took the conjoint diploma LRCP MRCS. After spending some time in Paris, Hugh Owen Thomas returned to Liverpool in 1858 and joined his father’s practice. A little friction developed between them as the educated son returned home with new ideas. Evan Thomas retired to Anglesey 2 years later. What sort of place was Liverpool in 1858? The first steam ships came in 1815 and were crossing the Atlantic in 1819. The first railway in the world was opened between Liverpool and Manchester in 1830. Consequently, the traffic through the docks was immense. With this came a vast number of labourers and dockers. However, there was no corresponding growth in the medical services to deal with injuries and other diseases such as tuberculosis, which was rife in the city. Therefore Hugh Owen Thomas was in a very special position to gain vast experience of injuries and skeletal tuberculosis. Hugh Owen Thomas then moved to 11 Nelson Street where he practised for the rest of his days. These are the lathes in Nelson Street where he had a workshop, a full time blacksmith, saddler and other men who made bandages and plasters for him. He also had a house in nearby Hardy Street which was an 8 bedded private hospital. By now he was the medical officer to 28 trade unions and had a very busy practice. His motto was “On”. He was a small, frail man but full of energy. His only holidays were 3 days a year when he visited his mother’s grave in Anglesey. Otherwise he worked 7 days a week for over 30 years. He said of himself “There isn’t a happier man in England than I am. I find my enjoyment in my work and my home and am never happier than here with all of you about and plenty of work. I would much prefer a short useful life to a long lazy one. I hope to die in harness”, which he did. His day started around 5-6 am with home visits as all fractures were treated at home, even open fractures. After breakfast he saw 30-40 of patients in Nelson Street. If they needed a splint it was made on the spot by his saddler and blacksmith. After a brief lunch he operated in Hardy Street. At 8 pm he did his last round of house calls but his day was not finished as he had work in his workshop to do or he would read or write in his study. He was a fairly prolific writer, subjects including breast, ovarian and oral cancer as well as intestinal obstruction. On average he saw 80 patients a day although a visitor from noted he saw 146 in Nelson Street and 16 at home in a single day. Many surgeons from America visited him and helped to disseminate his principles widely. 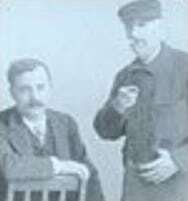 The Thomas’s splint was invented in Nelson Street and used to treat tuberculosis by prolonged and uninterrupted rest. 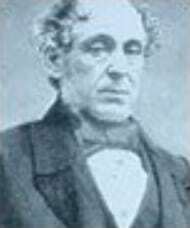 The principle had been established by his father and refined by Hugh Owen Thomas. Hugh Owen Thomas apparently went to only 4 medical meetings in his life. He did, however, receive may invitations including 2 to annual meetings of the BMA to demonstrate his method of using his splint in 1878 and 1879 but he declined as he was probably too busy. Therefore in 1883 part of the BMA meeting was held in 11 Nelson Street, Liverpool where 30 patients in various stages of tuberculosis of the hip were shown. Imagine the reaction of the audience when he removed his splint from a patient who had been treated for many, many months with the splint and full motion was seen in the joint. The alternative was surgical excision of the joint. 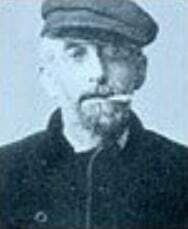 Robert Jones came from Rhyl and was a nephew of Hugh Owen Thomas. As he was orphaned at a young age, he was brought up in Nelson Street by his uncle. He later established the Robert Jones and Agnes Hunt Orthopaedic Hospital in Gobowen, which still plays an important role in the training of our young surgeons today. One of Robert Jones’s attributes was his organising ability. He was responsible for setting up the first accident service to deal with those injured when building the Manchester ship canal. During the Great War he was called up as a Brigadier and charged with the evacuation and treatment of those injured in the trenches. At that time the mortality from a femoral fracture, usually an open injury, was 80%. Robert Jones utilised the Thomas’s splint for the evacuation of the injured. The effect was astounding; the mortality fell from 80% to 20%. So that is the remarkable story of the Anglesey bonesetters with fate starting it all with the shipwreck of the Anglesey coast followed by the founding of a dynasty of bonesetters who forged the path for the development of orthopaedic surgery as we know it today.